After rain delayed the start for an hour, Rising Pune Supergiants' seam bowlers, led by Ashok Dinda, used the fresh Hyderabad surface and generated appreciable lateral movement to reduce Sunrisers Hyderabad to 32 for 5, setting up a crucial 34-run D/L win. In the chase, Faf du Plessis and Steven Smith consolidated the early loss of Ajinkya Rahane, before finding the boundary in every over of the Powerplay to ease Supergiants to their second victory of the season. With 25 required to win, rain returned to bring a premature end to the game. It was the 18th win by a chasing side in 22 games this season. 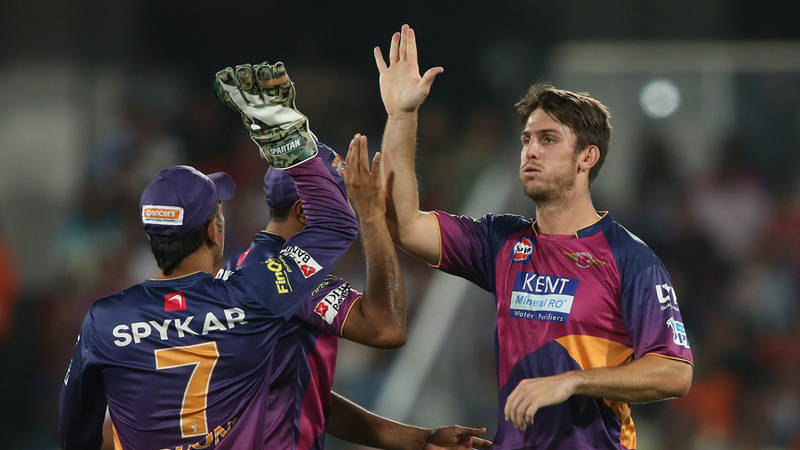 Supergiants' bowlers swung the ball throughout the Powerplay. In the first over, Dinda, making his debut for Supergiants, removed the in-form David Warner with a wide delivery that was cut straight to backward point, eliciting a Christiano Ronaldo-like celebration from the fast bowler. Thereafter, Sunrisers were continually tested against the moving ball. Dinda and Mitchell Marsh, in particular, used the swing on offer to increase the pressure on the batsmen with tight overs.